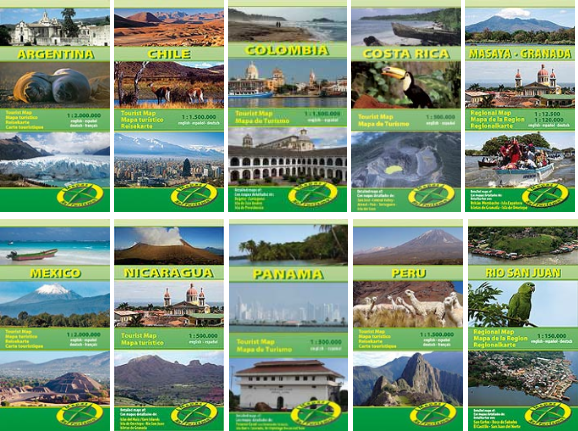 Mapas Turismo is a German publisher of Latin American country maps. The founder Klaus Wiesner is a strong supporter of the city twinning relationship between Frankfurt and Granada (Nicaragua). As a result of his professional, and passion for the region, he has brought first hand experience to the production of these fantastic maps. Coloured hill shading provides a three dimensional impression of the topography. Clear classification of highways, roads and tracks. A variety of icons focus on tourist attractions. Latitude and longitude lines support the use of GPS devices. Additional and more detailed maps shows the most important areas of touristic interest. A multi-lingual legend and the index of cities and villages complete the convenience of the maps.